Accelerated Reader program encourages students in grades 1-5 to read for pleasure by choosing their own books, taking on-line quizzes during the school day and receiving recognition and prizes for their accomplishments. The program kicks of September 5 and ends in early May. 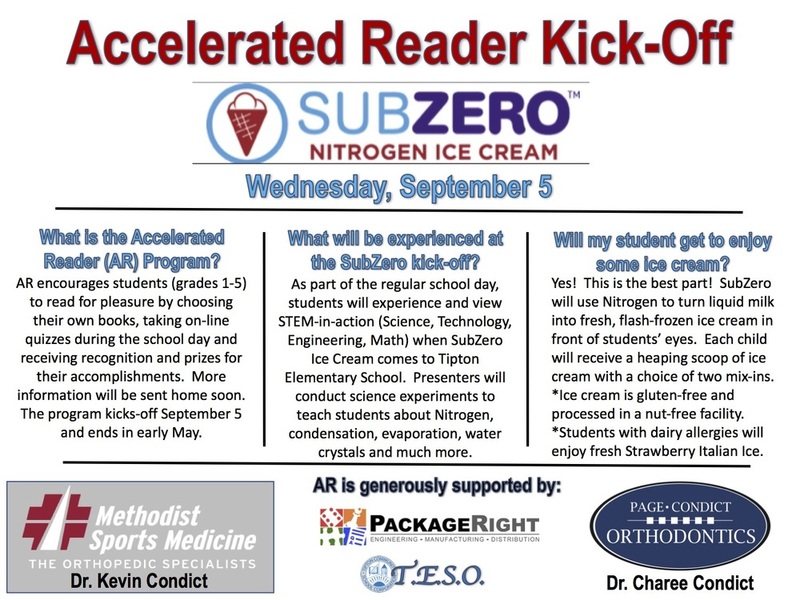 As part of our kick-off, students will experience and view STEM-in-action (Science, Technology, Engineering, and Math) when SubZero Ice Cream comes to Tipton Elementary School. Presenters will conduct science experiments to teach students about Nitrogen, condensation, evaporation, water crystals and much more. Students will be able to enjoy ice cream! SubZero will use Nitrogen to turn liquid milk into fresh, flash-frozen ice cream in front of students' eyes. Each child will receive a heaping scoop of ice cream with a choice of two mix-ins.